A solution to this week's Riddler Express from fivethirtyeight.com. Count Von Count, the counting count on “Sesame Street,” counts aloud on Twitter. If he counts up by one with each tweet — “One!” “Two!” “Three!” … “Five hundred thirty eight!” etc. — how high can he go before hitting the 140-character limit? 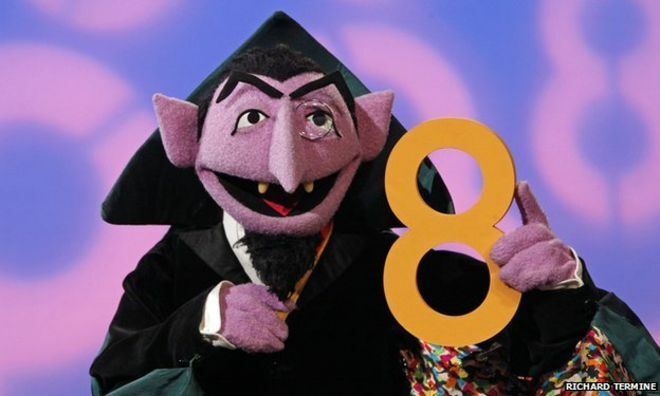 Note: The count is enthusiastic and must end all of his tweets with an exclamation point. There is a little lack of clarity here. Are we looking for the first number at 140 characters or the first number over 140 characters? I think the spirit of the puzzle suggests the second reading: “What’s the last number he can tweet?” So, we’re after the number that breaks the limit minus one. Three hundred seventy three billion three hundred seventy three million three hundred seventy three thousand three hundred seventy three! But this is only 137 characters. So, we must add one to the trillions place, and in the millions, thousands, and hundreds places we keep the longest-lowest 373. The idea is that we want maximum length in lower places, and minimum values in higher places. That leaves us with missing digits in the billions, a sort of “fill-in-the-blank” problem to figure out. So, what is lowest three-digit number that when spelled out is at least 18 characters in length? How do we know that we’re looking for a three-digit number at least 18 characters in length? R is convenient for character counting. We know our number is going to start with “one trillion ” and end with “ billion three hundred seventy three million three hundred seventy three thousand three hundred seventy three!” So, we can easily calculate the number of characters we need to “fill” to break the 140 character limit. One trillion one hundred eleven billion three hundred seventy three million three hundred seventy three thousand three hundred seventy two! One trillion one hundred eleven billion three hundred seventy three million three hundred seventy three thousand three hundred seventy three! That 111 is in the billions place is unsurprising, as this is the minimum value to also spell out all place names. Since we have all the data from this loop, it’s easy to plot the transition over the 140 character limit (again, see bottom of post for code). If the Count tweeted one number every second, it would take him nearly 600 years to reach this limit, by which time, Twitter will most likely be obsolete, thus rendering this whole riddle moot. # there's a stringsAsFactors option but why no integersAsIntegeres? # this function does not append the "!" # this one does add the "!"